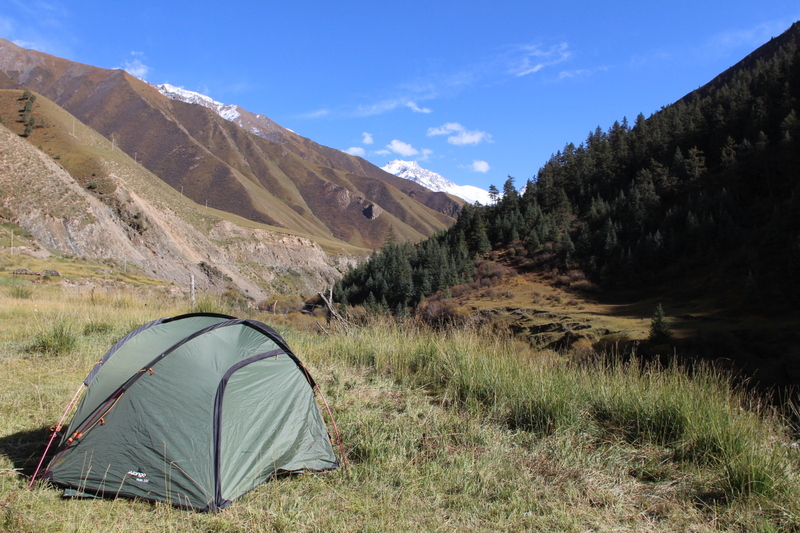 Gansu Provence – off the beaten track! China is a massive country. Too massive. Far too massive for us to cross by bike anyway, although we have met plenty of others giving it a go! (but not all successfully!) Our solution was a long distance coach followed by a two night train journey to take us around the enormous Taklmakan Desert and 2500km into the centre-north of the country. We had to use the services of our hostel in Kashgar to buy our train tickets as the booking system is ridiculously complicated, and in Mandarin. 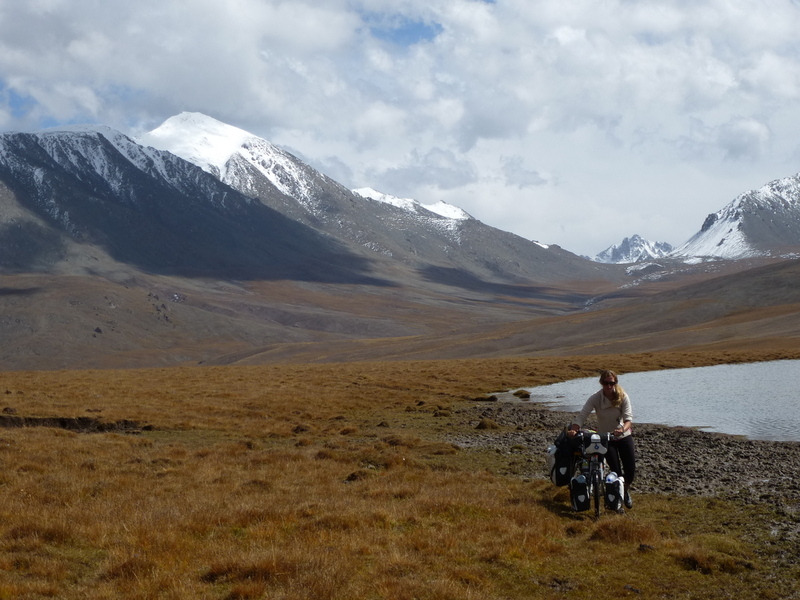 Our bikes were packed up and sent ahead using the China Railway Postal Service so we had to wave them goodbye with the hope of seeing them again a few days later in Zhangye. There is no room on the passenger trains for all the passengers, let alone excess luggage. Should you wish, you can buy “standing only” tickets – even for an overnight train – it seemed as though you just sleep in the aisle!! 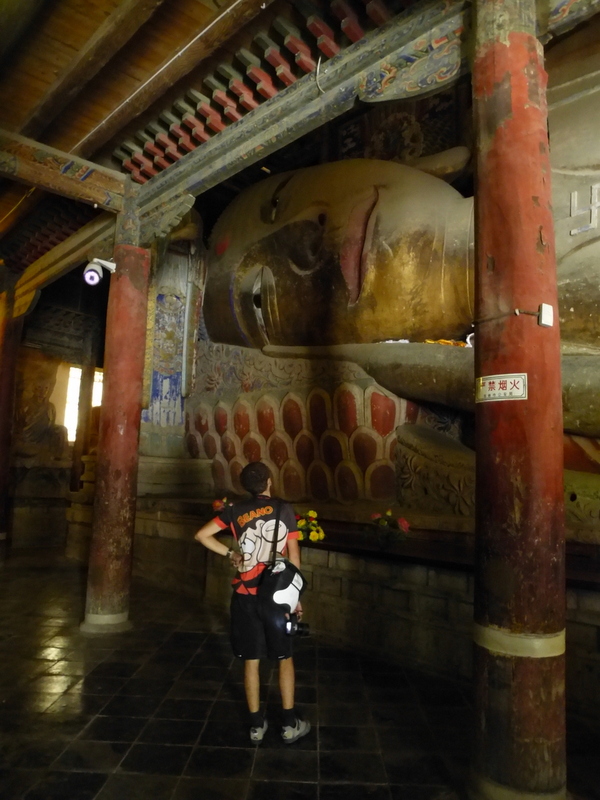 Tim inspects the ‘Sleeping Buddha’ in Zhangye – One of the many solar collectors we saw…. 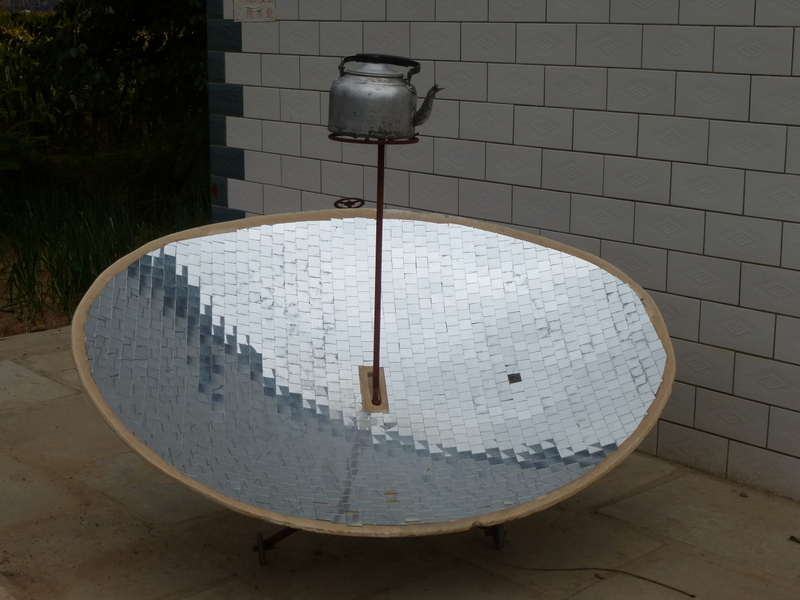 get a brew on! After 150km of perfect and quiet roads, the tarmac just stopped! Completely finished! But the climbing still continued……, the only traffic was quarry lorries. …. 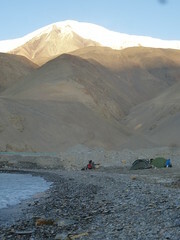 and super scenic camping spots – no facilities though! As we were on a gravel road, we didn’t spot that the official road had turned off, and we spent a day pedalling towards a dead end and our highest point yet – how annoying! 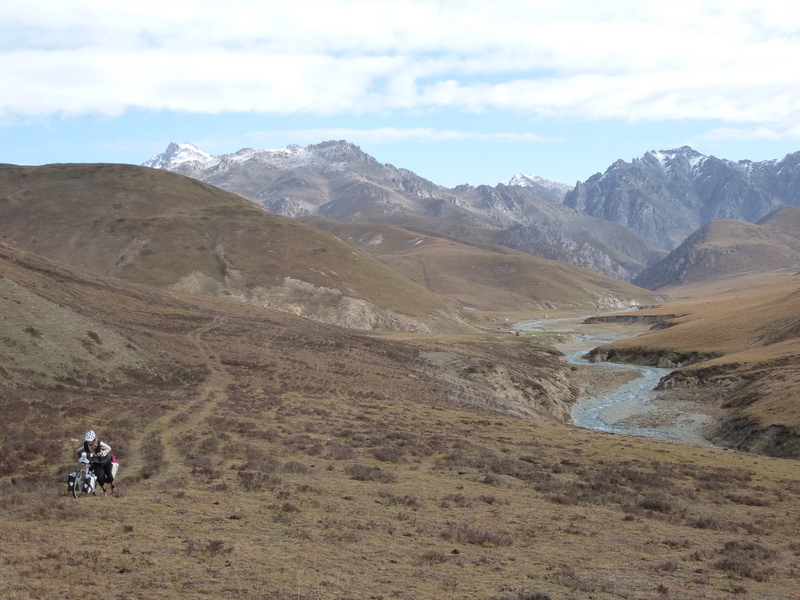 After resting for the night, we decided to ignore the local’s advice to turn around and we carried on to follow the track through a ‘valley’, taking the most direct route back to the road we should have been on. 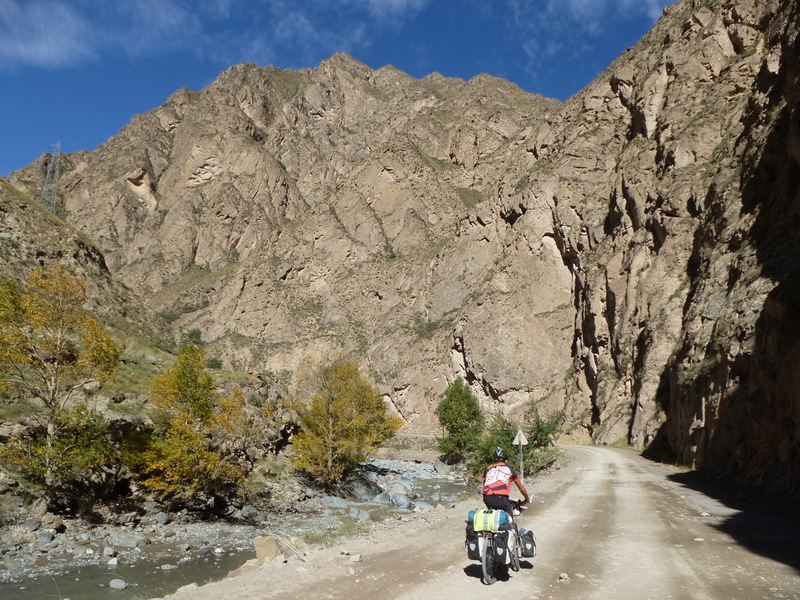 The route got pretty knarley and we did quite a bit of bike trekking – not easy with fully loaded and very heavy tourers! 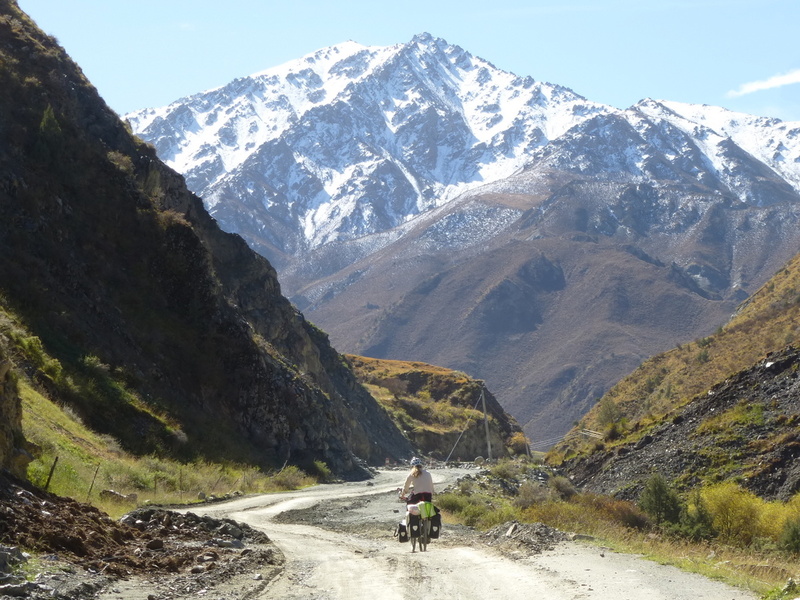 As we crossed over 4000m the “track” disappeared and turned into a bumpy rutted field. Progress was extremely slow and painful! The storm that had been following us all day eventually caught us up, and we were having to walk the bikes downhill, as it was definitely not rideable. The situation was getting pretty dire so there was no time to take photos… but imagine walking down a very steep and rocky riverbed stewn with boulders and a blizzard blowing in your face and you’ll be getting close. 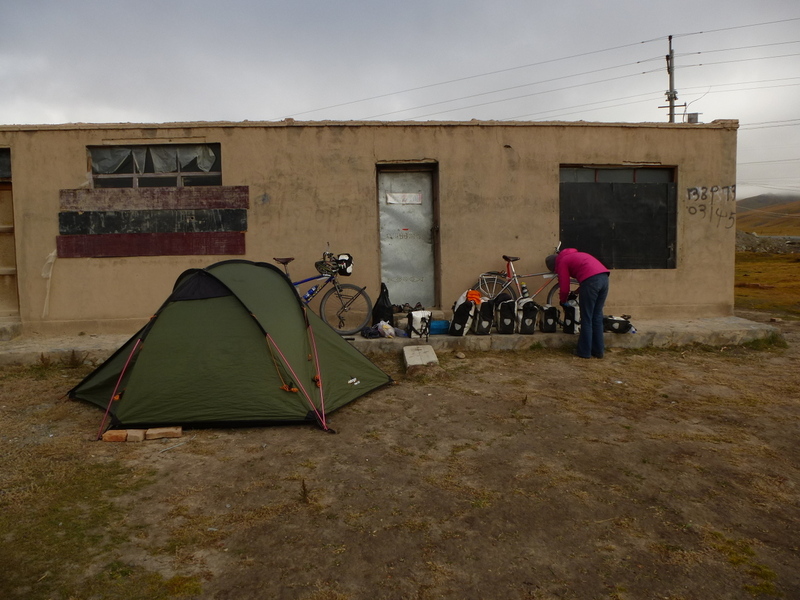 At the main road we found an abandoned building so we set up the tent on it’s lee side, zipped up the canvas and put on our remaining clothes! (This photo was taking in the morning when the sun had come out!) 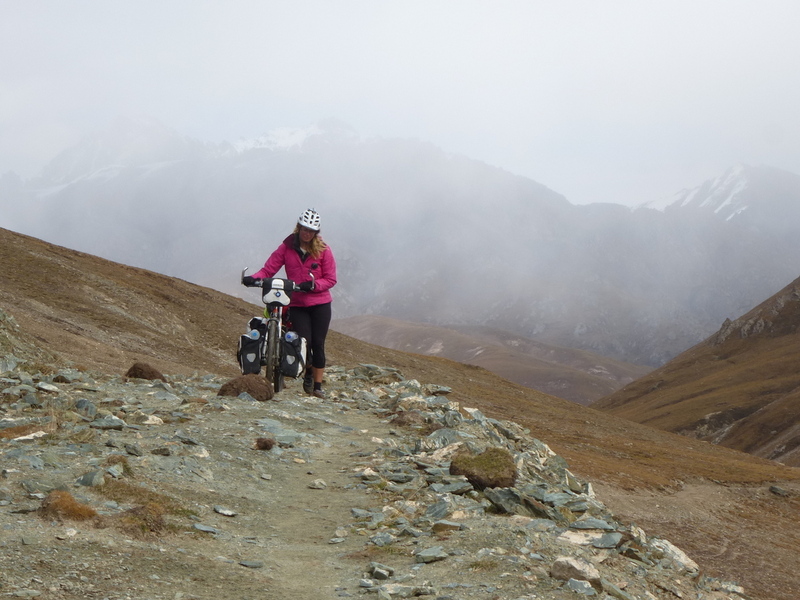 China was living up to our expectations with it’s testing terrain and testing weather – although we were sure this was only a taster!